In March 2002, a trove of Malcolm X’s personal papers—hundreds of pages of letters, photographs, diaries, handwritten drafts of speeches—turned up for sale at an auction house in San Francisco. The Shabazz family reclaimed the material and lent it to the Schomburg Center for Research in Black Culture, in Harlem, where it has been on display since 2008. The collection, at least what’s available for public viewing, shows Malcolm X as an avid reader and meticulous chronicler. It includes everything from letters to Henry Kissinger and Dean Rusk to Paris Metro ticket stubs and a marked-up translation of Sartre’s Black Orpheus. Malcolm’s writings, especially the diaries, are a delight to read, showing the activist’s political evolution as well as a more quotidian side. There’s the militant leader reflecting on the “hip-swinging” jazz vocalist Dakota Staton. There’s Malcolm preparing for a talk with social workers in Harlem about how his organization rehabilitates drug addicts, offering what The New York Times termed “Black Muslim therapy.” We also see Malcolm feeling “extremely persecuted” and confiding, to Maya Angelou, that he may have his passport revoked. The diaries also provide a firsthand account of Malcolm’s travels in Egypt, Ghana, Palestine, and Saudi Arabia in 1964. There’s Malcolm crossing Tahrir Square to buy some lemonade at Groppi’s, a still-existing pastry shop; then he’s buying pajamas, picking up vitamin C tablets (because he’s feeling kind of “woozy”), going to the movies, and so on. He had previously traveled to Africa and the Middle East in 1959 as a representative of the Nation of Islam. But in April 1964, after publicly breaking with the group, and just weeks after founding his own organization, Muslim Mosque Inc., Malcolm embarked on a longer trip, visiting Egypt, Saudi Arabia, Lebanon, Liberia, Senegal, Nigeria, Algeria, and Ghana. This time, he felt that he was representing the interests of more than 20 million African Americans. He made the hajj to Mecca and adopted the name El Hajj Malik El Shabazz. He met with myriad heads of state and local elites, in an effort to build support for his organization. He pushed to have the United Nations and the Organization of Afro-American Unity address the issue of African-American rights at a time when America’s Cold Warriors knew that, internationally, race was the country’s Achilles’ heel. His is the perspective of a ghetto dweller who has transcended the borders drawn around him. Traveling abroad, he wrote, felt “as though I had stepped out of prison.” The diaries—several notebooks of single-spaced handwriting—show an anthropologist’s eye. Malcolm comments on the landscape, the politics, and the cultural and religious differences with humorous asides. At one point, he observes: “The worst most dangerous habit among Arab Muslims is cigarettes. They smoke constantly, even on the Hajj.” There are also personal reflections on his mood, health, and intense solitude. The words “lonesome” and “alone” appear on almost every other page. In his final years, Malcolm embraced Sunni Islam, but the ideology he would have aligned with is today the subject of intense debate, with observers projecting their own predilections onto his imagined trajectory. In Egypt, he found a cosmopolitan progressivism but was wary of President Gamal Nasser’s secularism; in Saudi Arabia, he found a religious orthodoxy to counter the Nation of Islam’s teachings, yet he was suspicious of the kingdom’s reactionary politics. By early 1965, Malcolm was still searching for a theology that could offer relief from racism, inequality, and imperialism. As such, he has become a powerful lens through which to understand America’s post–Cold War ascendance and expansion into the Middle East. And because many young Muslims are searching for much the same relief, he also offers an opportunity to understand how geopolitical shifts affect the earth’s wretched. W.E.B. Du Bois once observed that African Americans have a “great message” for humanity, and would offer the world a conception of freedom that rivaled those born in Greece and France. This offering to the world was, in Du Bois’s estimation, to be disseminated via the African American’s “magnificent art impulse.” “We are that people whose subtle sense of song has given America its only American music, its only American fairy tales, its only touch of pathos and humor amid its mad money-getting plutocracy,” Du Bois wrote in 1897 in “The Conservation of Races.” Especially with the end of the Cold War, the black freedom movement—with its message of social solidarity and its opposition to racism, militarism, and imperialism—became an attractive progressive alternative. It has appealed to marginalized groups worldwide, but it has special meaning for Muslim youth. This quest has led young European and American Muslims—often converts—toward Africa or the Middle East, in search of an authentic Islamic identity. But today it’s also common to see young Muslims from Europe or elsewhere head westward across the Atlantic, to an American metropolis, in search of religious freedom or simply to immerse themselves in black history. The reason for this westward drift is partly the dismal state of progressive politics in the Muslim world. Cold War policies and local authoritarianism have created a Muslim political landscape dominated by the right—groups like the center-right Muslim Brotherhood, the ultraconservative Salafi movement, and jihadist groups like Boko Haram, Al Qaeda, and ISIS. The interest in the black freedom movement, for Muslim youth, is part of a larger turn toward an American conception of race and black internationalism, a response to recent political convulsions. It fills a political void and offers a sense of belonging. The image of Malcolm X has circled the globe and remained relevant thanks, in part, to hip-hop, Spike Lee’s 1992 biopic, and the Internet. In the late ’80s and early ’90s, when the Nation of Islam had a vibrant presence in American inner cities, Islamic references permeated hip-hop. Public Enemy and Ice Cube sampled the speeches of Malcolm X and Louis Farrakhan in their music. The video for Public Enemy’s 1991 “Shut ’Em Down” showed Malcolm’s face on the dollar bill. America’s main contemporary musical export would reach distant corners of the globe, introducing youth worldwide to African-American history, the black freedom struggle, and the various types of Islam referenced therein. By the late 1990s, the Nation of Islam was in decline and the references to Malcolm had diminished, but a rich melding had taken place globally: Many marginalized youth now express their politics in distinctly African-American terms. Some embrace Islam; others launch Black Panther–like movements. Malcolm’s face appears today throughout the Muslim world and in the Muslim enclaves of Europe. For those who find black history liberating, here is an individual to whom history has clung like metal shavings to a magnet. After the Camp David Accord and the cementing of the Egyptian-Saudi alliance—which would become the linchpin of American power in the Arab world—left-leaning Black Muslim groups found themselves bereft of economic and political support. The Saudis withdrew their support for Muslim Mosque Inc. upon Malcolm’s death in 1965. The Salafi movement and the Muslim Brotherhood would expand their presence in Western cities following the first Gulf War. The Muslim Brotherhood is economically and socially conservative but believes in political participation and coexistence with non-Muslims. The Salafi movement, on the other hand, while also economically conservative, is, with few exceptions, largely opposed to political participation, seeing it as corrupting and preferring instead to separate from the larger society and focus on “self-rectification.” But the Salafis’ libertarian political attitude—not asking anything of the state—fits well with the Reaganite and Thatcherite free-market thinking of the 1980s and ’90s: As the state stopped providing services and amenities, religious groups, including Islamists, stepped in to fill the vacuum. The Salafis’ ultraconservatism and intolerant rhetoric, though recognized as a potential problem, was, proponents argued, mitigated by their political quietism. Similar arguments were made in the 1960s in defense of the Nation of Islam’s economic and social conservatism. In their pioneering study Beyond the Melting Pot, Nathan Glazer and Daniel Patrick Moynihan lamented the Nation of Islam’s “nationalist and racist” tendencies while lauding the movement’s “traditional values” and “Horatio Alger” entrepreneurial spirit. In the 1990s, in the United States and Europe, the ability of Islamist groups to patrol the streets, rehabilitate young men, restrain antistate sentiment, and mobilize capital through their economic networks was seen as an asset to cash-strapped city governments. After 9/11 and the London and Madrid bombings, as it became evident that the quietest Salafis could not control the violent extremists in their midst, the Bush and Blair governments cracked down on Salafi organizations and began to look for an alternative Islam to back. It was around this time that state officials started taking a keen interest in Malcolm X, prompted by the case of John Walker Lindh, a young American who, in December 2001, was found in Afghanistan fighting with the Taliban. Specialists argued that Lindh came to jihadism through Spike Lee’s movie and hip-hop. The specter of Malcolm X tends to arise among beleaguered urban minorities in peripheral areas where the state can’t fully reach, with the exception of heavy policing. In recent years, we’ve seen the emergence of the New Black Panthers in Paris, the Pantrarna in Gothenburg, and the Black Panthers of Athens, the latter formed by immigrants for self-defense against the far-right Golden Dawn party. In North Africa and the Middle East, interest in Malcolm X surges during democratic openings, when the political left stirs. It’s no coincidence that Turkey, the region’s oldest democracy, is the country where Alex Haley’s The Autobiography of Malcolm X was first translated, and where a slew of books in Turkish are available on Malcolm’s speeches and ideas, including an illustrated biography for high-school students. The first Arabic translation of The Autobiography appeared in Morocco in 1996, just as the ruling monarch began liberalizing, allowing more space for political parties and civil society. The 2011 revolts throughout the Arab world sparked a new wave of interest in Malcolm X. In August of that year, a bookstore owner in Cairo told the newspaper Al-Akhbar that since Mubarak’s downfall Che Guevara’s and Malcolm X’s memoirs had become best sellers. A new Arabic translation of The Autobiography was published in Cairo in late 2011. The current interest exists partly because of the parallels between the Arab cold war of the 1960s and the current Middle Eastern cold war between Saudi Arabia and its allies (Egypt and the American-backed monarchies) and Iran and its allies (Syria, Iraq, and Hezbollah). 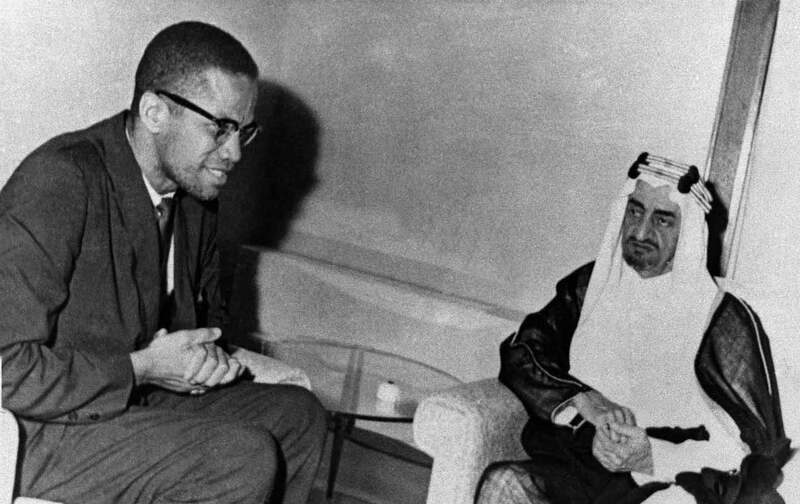 It comes as no surprise that interest in Malcolm X surged in Egypt during a moment when a democratic transition seemed possible, when it appeared that the country could wriggle its way out of the Saudi-US chokehold. In chat rooms, students wondered: What would Malcolm think of the Muslim Brotherhood? Or of the Sunni-Shia conflict? Iran claimed Malcolm X’s legacy in 1984, releasing a stamp in his honor to promote the Universal Day of Struggle Against Race Discrimination. (The United States issued its own Malcolm X stamp 15 years later.) After the US invasion of Iraq in 2003, when Iran appeared ascendant, a number of young Muslim activists argued that Shia Islam, with its traditions of protest and minority consciousness, was better suited for Muslims in the West than the Sunni variety. This argument was famously made by Malcolm Lateef Shabazz, Malcolm’s grandson, who embraced Shia Islam and moved to Syria in 2007. He became quite popular among Muslim youth in Europe and the United States, lecturing and starring in political hip-hop videos, but caused an uproar at an event in Detroit in 2011 when he spoke negatively about the sahaba (the Prophet’s companions) and declared that had his grandfather lived, he would have embraced Shia. The states trying to contain Iran underlined, in turn, Malcolm’s Sunni credentials, including the Saudi-based Salafi evangelists who appear on Saudi television regularly and the Muslim-American hip-hop ambassadors dispatched by the State Department. Ironically, Malcolm, who despised American diplomacy and the US Information Agency’s efforts to use black culture for propaganda, is now being used as a diplomatic tool—and not just by the United States. American officials are aware of the hunger for African-American history among Muslim youth, and the power of black music; various soft-power projects have been launched to tap into this vein. American embassies now sponsor events during Black History Month and on Malcolm’s birthday, celebrating Obama and the post-hajj Malcolm X together, accenting their meteoric rise to international eminence and their relationship to Islam. For them, Malcolm X is the “symbol of a vital, open America” that made Obama’s presidency possible. It’s hard to exaggerate all the geopolitical maneuvering and countermovements that Malcolm X, in life and in death, has provoked. He most obviously inspired the Black Power movement, yet his critiques of Christianity as the “white man’s religion” would also trigger a crisis of faith in Christian thinkers like James H. Cone and give rise to Black Liberation theology. Likewise, for all that has been written about neoconservatism in the last decade, little has been said about how this ideology emerged partly in response to black radicalism and the discourse of Afro-Arab solidarity put forth by Malcolm and then Stokely Carmichael. That black nationalists and African-American Muslims were claiming solidarity with the Arab world, describing Islam as color-blind and not talking about the trans-Saharan slave trade, was particularly galling to the neoconservatives. “We can understand why many blacks would give up the name and language of the white men who bought them as slaves, but why on earth would they want to adopt the name and language of the Arabs who sold them into slavery?” asked Bernard Lewis, a British scholar of Islam who had warily watched Malcolm and the rise of Islam among African Americans from his perch at the University of London. In 1971, Lewis published Race and Color in Islam, which directly challenged Malcolm X’s view of Islam and questioned his epiphany during the hajj. Today, “Eurabia” literature warning of a weak Europe being overrun by Muslims is informed not only by an American Cold War outlook, but also by the memory of Black Muslim agitation and the tumult of the 1960s. French and Dutch commentators cringe when Malcolm-style agitators start speaking of black or Muslim power, finding the language distastefully American. The Eurabia genre tends to single out Tariq Ramadan, the Egyptian-Swiss theologian, for reproach. Ramadan, whose grandfather founded the Muslim Brotherhood, is a dapper, globetrotting scholar popular among Muslim youth worldwide. He not unintentionally evokes the specter of Malcolm X, posing like him in photographs and telling rapt audiences how he sat on Malcolm’s knee as a toddler, and how the last letter on Malcolm’s desk was addressed to Ramadan’s father, who he claims brought the American into Sunni Islam. “Ramadan is said to have been influenced by the example of Malcolm X in the United States, or at least by Spike Lee’s Malcolm X,” writes Paul Berman, another American leftist turned Eurabia alarmist, in a profile of Ramadan in The New Republic. “Ramadan, who has something of Malcolm’s air of touchy dignity, has nothing of Malcolm’s demeanor of unstated threats,” he concludes. Policy-makers in Europe and the United States, who see the parallels and connections between the racialized militancy of 1960s America and the Islamist militancy of today, realize that Malcolm X can’t so easily be airbrushed out. Malcolm is the bridge that connects a certain view of these eras and communities; through him, the history of black protest flows to Europe’s urban periphery. Even the security policies once used to neutralize black militancy are now being employed to contain Muslim youth—for example, the NYPD’s surveillance program was modeled after the FBI’s Ghetto Informant Program, introduced in the 1960s to monitor black neighborhoods. American policies, from “broken windows” policing to racial classification to the stripping of citizenship, are also being exported to Europe. Moreover, the public discourse about Muslim youth echoes the narrative about “undersocialized” black youth, which asserted that cultural pathology, bad behavior, and unbridled sexuality—not two centuries of government policy—was holding these young men back, and the real solution was a belief system that taught hard work, respectability, and self-improvement. But young Muslims across the world have held on to their version of Malcolm, too. And with nationwide protests and new solidarities forming—with youth in Ferguson proclaiming their support for Mexico’s missing students, and activists in Syria holding signs saying “I Can’t Breathe”—we may see young Americans rediscover Malcolm X and American internationalism all over again. One warm morning in May 2015, hundreds of people lined up to board buses on 125th Street and Seventh Avenue in Harlem. The signs on the buses read “Annual Malcolm X Day and Pilgrimage.” The excursion is hosted by the Organization of Afro-American Unity (an outfit that Malcolm founded in 1964) and has taken place on his birthday every year since his death. The caravan of buses left Harlem and wound its way to Ferncliff Cemetery in Hartsdale, some 20 minutes north of Manhattan. Upon their arrival, the visitors—including dozens of schoolchildren—lined up, waiting for the ceremony to begin. A throne-like low wooden chair was placed near the adjacent graves of Malcolm X and Betty Shabazz; an embroidered gold cloth and a framed portrait of Malcolm were placed on the “throne.” The drumming began, and young men in white robes and skullcaps walked forward, forming two lines in front of the chair; other groups followed into the ceremony area and formed a semicircle around the grave. The event draws groups from around the country and the Caribbean. The tone and attire recall an earlier era: young men and women in Black Panther and Garveyite military uniforms; older men in flowing, white-sleeved African robes; women in resplendent gowns and head wraps. For two hours, Imam Talib Abdur Rashid, a Harlem-based cleric, leads a program that includes speeches, testimonies, and prayers, and concludes with the folding of the red, black, and green pan-African flag, which is then handed to someone who was close to Malcolm, a family member or one of his aides, the last of whom died in November 2015. I’ve been attending this “pilgrimage” for over a decade and have watched it grow and change. It’s still largely an African-American affair, but each year brings more visitors from other communities and from overseas—mostly young European Muslims. The pilgrims pay their respects differently. Once the flag is folded, devotees usually approach the grave, pour some water on the soil around it, and have their children place hands on the bronze memorial plaque. But people are also leaving offerings now, like fruits or candles, and collecting a little soil to take back home with them. Visitors will leave their prayer stones or beads on the grave during the ceremony, to absorb the martyr’s baraka. And it’s not unusual to hear those with Sufi leanings describe the journey to Malcolm’s grave as a mausam (a pilgrimage to a saint’s shrine), and the anniversary of his death as an urs (a saint’s union with his beloved God). Manning Marable’s Malcolm X: A Life of Reinvention, published in 2011, famously drew the wrath of leftist critics like Amiri Baraka, who thought the historian misrepresented his subject, presenting him as “moderate” and “race-neutral.” But the book also rankled religious conservatives. In it, Louis Farrakhan tells Marable: “I never saw Malcolm smoke. I never saw Malcolm curse. I never saw Malcolm wink at a woman. I never saw Malcolm eat in between meals. He ate one meal a day…. Malcolm was like a clock. He got up at 5 o’clock in the morning to say his prayers.” This is the image that Muslim community leaders have of Malcolm as well: a stunningly self-disciplined and self-abnegating individual, who stands as a testament to the power of Islam to inspire and rehabilitate. But Marable’s book and the diaries at the Schomburg Center puncture this image, describing a man who enjoyed a rum and Coke, had a roving eye, and—at least when overseas—ate more than one meal a day. In 2013, Ilyasah Shabazz, Malcolm X’s third daughter, and journalist Herb Boyd published Diary of Malcolm X: 1964, which hews closely to the original diaries but doesn’t include his random jottings in between the daily entries. Thus, on Malcolm’s trip to Gaza in September 1964, readers won’t see his scribbled reference to the Khan Yunis refugee camp, his attempts to write in Arabic script, or his handwritten rendition of a poem about Palestinian exile by poet Harun Hashim Rashid, whom Malcolm met in Gaza. But the edits and commentary in the published diary don’t seem intended to assuage the pique of religious conservatives or left-wing critics. For example, on November 15, 1964, Malcolm arrived in Geneva and checked into the Hôtel Du Rhône—after which Fifi, a Swiss UN secretary whose full name Malcolm doesn’t reveal, came to see him. They talked for several hours. “She claims she is in love with me & seems willing to do anything to prove it,” Malcolm wrote. The following morning, “I slept late then went to buy an overcoat.” He took a tour of the city and the UN headquarters, “had a glass of wine,” and then met with Dr. Said Ramadan. At 9:15 pm, Malcolm returned to his hotel room. “Fifi was knocking on my door as I came up the stairs…. We talked till 11pm and she left. I went for a walk in the rain, alone and feeling lonely…thinking of Betty.” In Shabazz and Boyd’s book, this potentially controversial passage is included, but for some reason the phrase “thinking of Betty” is left out. The daughters who commissioned the publication of the travel diary seem mainly interested in protecting their father’s reputation against Marable’s allegations of infidelity. The diaries show something else: When not in Saudi Arabia, Malcolm seemed to enjoy being away from his role as a religious leader, and away from religious strictures as well. He immersed himself in the cultural life of these newly independent states, and the younger Malcolm, the music aficionado, resurfaced. He frequented nightclubs and dance centers. In Nairobi, he went to see his friend Gee Gee sing at the Equator Club, and then accompanied Vice President Oginga Odinga to a party at the Goan Institute of Dance. (“The PM is a good dancer, remarkably for his age,” he writes.) But it’s mostly in Egypt, which he saw as the bridge between Africa and Asia, a key player in the Non-Aligned Movement, that he spent the most time and experienced the most cultural immersion. What’s important about the portrait of Malcolm X that we get in these diaries is that it’s different from the many versions that have been crafted for political or ideological aims. “I have difficulty praying. My big toe is not used to it,” Malcolm confided to his diary on April 20, 1964, shortly after arriving in Mecca. Having recently left the Nation of Islam and its practices, he was still acclimating to sitting on his knees during prayer. Despite the pain, he embarked the following day on the journey to Mount Arafat, part of the hajj pilgrimage, joining “hundreds of thousands of pilgrims, all colors, buses, car, camel, donkey & foot.” Mecca, he writes, is surrounded by the “cruelest looking mts [mountains] I’ve ever seen. They seem to be made of the waste material from a blast furnace. No vegetation on them at all. The houses are old & modern. Some sections of the city are no different than when the Prophet Abraham was here over 4000 [years ago]—other sections look like a Miami suburb.” Wandering among the pilgrims, Malcolm describes the rituals—the seven stones cast at the devil, the circumambulating of the Kaaba—and observes, “This would be an anthropologist’s paradise.” So, too, is the legacy of Malcolm X.
Hisham AidiHisham Aidi is a lecturer at Columbia University’s School of International and Public Affairs. He is author most recently of Rebel Music: Race, Empire and the New Muslim Youth Culture, winner of the 2015 American Book Award.